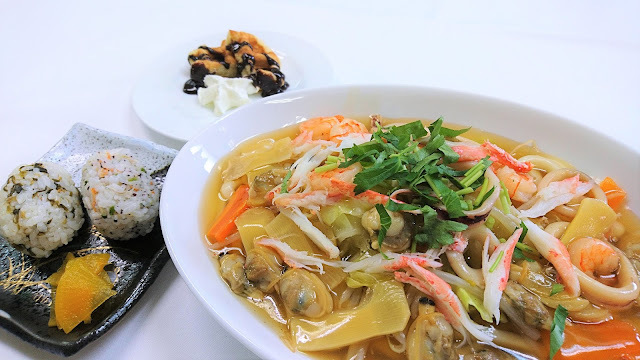 ･Seafood and Vegetables with Starchy Sauce on Udon noodles.（Udon:wheat noodles）. Seafood: squid, shrimp, scallop, asari clam and crab. ･Serve with rice ball and dessert（waffles） . Rice ball (two kinds): Rice ball mixed with Japanese pickled Nozawana. Rice ball mixed with dried young sardines.